One is a fabulous overlapping collage of color. The other is an exhibit of order and creativity. Which one do you like the best? UPDATE! This comment by Brian Miller made me laugh out loud!! He said: "wow. mine would be the one that looks like it was put up with a shotgun. a little here there and everywhere. some interesting things too when you magnify these pics." Souces: Top collage first appeared on the beautiful Decor 8 blog and the bottom collage is from the lovely Oh. Hello Friend. Inspiration comes to me in a jumble, so I vote top as well. I love the disorder of the top one, and the pink tone of the bottom one. I especially like the rows of written cards and notes with just one black and white portrait card, like a lovely intruder. Gorgeous. By the way, I just discovered your blog and can already tell I'll be hooked! I like both, but the top sums it up for me, an organized mess. oh I love the second one! #2 gets my vote - gorgeous! it's got to be the top one, it made my heart race a little faster. and think, have i got time to start an inspiration wall this evening...? wow. mine would be the one that looks like it was put up with a shotgun. a little here there and everywhere. some interesting things too when you magnify these pics. I wish I could say I like the top photo but unfortunately clutter makes my mind feel cluttered. I've got a disordered mind and heart so I definitely go with the top one. Mine would have to be the top collague. I am actually putting up a very similar collague, of things I have been collecting for years, this week in my closet. I love the freedom of the first one, but I like the presentation of the second one better. both lovely, but if i had to choose, i think i prefer the top space. the jumble in my head more closely resembles that one. have i mentioned how i love your blog? you're fabulous darling. I am moving house tomorrow and am just about to go ad take down my inspiration wall! At the moment it very much looks like the top one, but I am hoping when I re-assemble it in my new house it will be more orderly like the bottom one (hopefull I can keep it that way!) 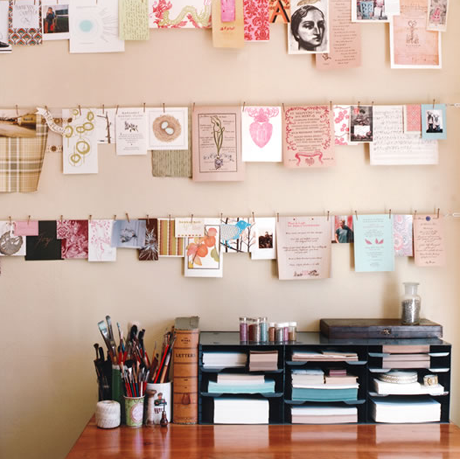 I love a creative mess, but I'm really craving order and simplicity, living and working in a mess can be draining! I WISH I were like the second picture. Alas, I am the first pic--all crazy scattered from top to bottom. But the second sure is pretty! I have to agree with half - the top half is what my board looks like - a big explosion (yes shotgun style I agree with Brian Miller) But I do love the orderly hanging of inspiration on the second... washing on the line - I am inspired to aspire too - dear Tina, thank you for making my brain twirl in delight. 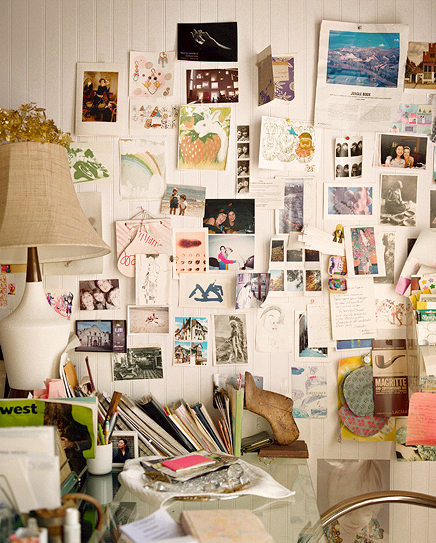 I'm too much of a neat freak to have the scattered collage on my walls; I would feel the constant urge to prune and straighten everything, so I'm definitely drawn more to the second one. Love these! The first one would be mine...I don't like things all in order, etc. I like both. The pinks in the second are so lovely. But I think I am more like the first messy type. both are very cool. I think I lean towards the more orderly one but in reality it would come out looking like the first example. I like the second inspiration wall. peaceful & orderly!! This is a tough one since both are equally appealing. But, I'll go with the latter -- the organized one. I like te second one! I love both the pictures... but the top one is more me !! I heart inspiration walls. I want to cover my entire place with inspiration! !